On the welcome screen, click "Fix Track Info"
All of the tracks which may have incorrect or missing information will be displayed. Click "Download Information for all Tracks"
When you're happy with the changes, click "Save Changes to iTunes"
Tune Sweeper is able to download missing track information whilst also allowing quick manual changes. 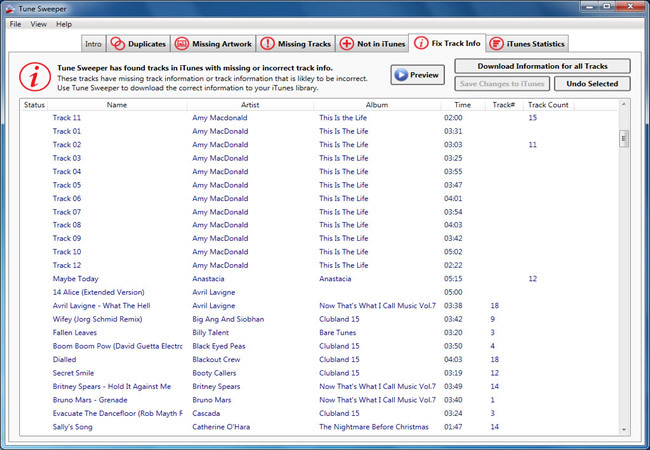 To see which tracks are currently missing information, select the "Fix Track Info" tab at the top of Tune Sweeper. You can manually modify each track's information by clicking on the field that you would like to edit. You can then type directly into that field. Any field that has been modified will turn red to show that a change has been made. You can also download track information by clicking the "Download Information for all Tracks" button at the top right of the Tune Sweeper window. Tune Sweeper will then search for the correct information and display any matches to you. On certain occasions Tune Sweeper may find multiple matches for the same track. When this happens, the tracks field will turn into a drop down box allowing you to select the match that your prefer. Once any modifications have been made, you can save the changes by clicking on the "Save Changes to iTunes" button also in the top right corner of Tune Sweeper. If you do not want to save the changes to iTunes, you can press the "Undo Selected" button to undo changes to the selected tracks.